We are delighted that the CEO of the Fairtrade Foundation, Mike Gidney, will be visiting Yorkshire during Fairtrade Fortnight. 1 March – Fairtrade School Conference, Leeds. KS2 and 3 pupils and teachers are invited to participate in Leeds’ 9th Fairtrade School celebration, organised in collaboration between Leeds DEC and Fairtrade Leeds! Book your school’s ticket here. 2 March – Holme Valley Fairtrade are running ‘Banana Breakout’ on Saturday 2nd March when we will take to the streets of our two local towns: Holmfirth and Honley to hand out free Fairtrade bananas and other goodies and raise awareness of Fairtrade. 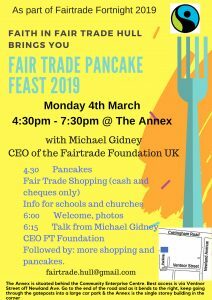 4 March – 4pm – 7.30pm – Hull Fairtrade Partnership and Hull Faith in Fair Trade are holding a Pancake Day celebration at the Annex, Cottingham Road. Come along for refreshments including pancakes with your choice of Fairtrade toppings, a stall from Fairer World and meet Fairtrade CEO Mike Gidney. Find out how your church, school or business can support Fairtrade. 5 March – 8.30 – 10.10 York Fair Trade Forum is holding a business breakfast at the Spurriergate Centre in York city centre on Tuesday 5 March. All are welcome for free tea, coffee and juice, and toast with a range of Fairtrade and fair trade jams, spreads, honey and marmalade. Meet the CEO of the Fairtrade Foundation, Mike Gidney and find out how you can support Fairtrade. 6 March – Huddersfield University is holding a Fairtrade celebration on Wednesday 6th March at 6pm at the University campus and celebrates the past year’s Fairtrade achievements and activities of Fairtrade Kirklees members, including local campaign groups, churches, businesses and schools. We ran a similar and successful event last year – a wonderful evening that attracted much positive feedback. This year we’re hoping to broaden our audience and inspire more people and organisations to get involved with Fairtrade. 7 March – York St John University will hold a Fair Trade Market. 9 March, 11am – 2pm, Traidcraft stall in Christchurch, Ilkley foyer next to the Fairtrade cafe. Sat. 9 th March. 10am – 2pm. Fairtrade drinks and cakes, plus Fairtrade product tastings, in the Old Mall Café, Airedale Shopping Centre, Keighley The event is to tie in with International Women’s Day on 8 March and the Fairtrade theme of ‘She deserves a living income’. 13 March – 7pm at Bish Bash Pot, Walmgate, York – Join us to celebrate 15 years of Fairtrade City status in York by painting a pot in a Fairtrade theme. Book your ticket here. 16 March – 9.30 – 11.30am, Christian Aid coffee morning, Methodist Church, Burley in Wharfdale. There will be cake and gift stalls. Fairly traded crafts, accessories and food items will also be on sale. 17 March – Fair trade and Brontë Society Spring walk from Thornton to Haworth, celebrating Rev Patrick Brontë and focusing on his social reform campaigning, including universal education. 9am for 9.30am departure from St. James’ Church, Thornton, via Denholme. Arrive Haworth Old School Room approx 2pm for Fairtrade refreshments and to join the ‘Brontë 200’ event commemorating Rev. Patrick Brontë. He was born on 17 th March 1777 and invited to take up the post of perpetual curate in Haworth in 1819. Additionally Shipley Fairtrade Group has permission to have a table with Co-op FT products, Bertie and Brenda (our inflatable bananas), and posters in the windows in Saltaire Co-op during Fairtrade Fortnight. presented with a hamper of Fairtrade goodies donated by local supermarkets. The competition links with International Women’s Day on 8 th March and will highlight inspiring female Fairtrade cocoa farmers. York Fair Trade Forum will be using the foyer of City of York Council’s West Offices for our display boards featuring our past events and successes, along with fair trade leaflets and posters to draw visitors’ attention to Fairtrade Fortnight. This entry was posted on Tuesday, January 15th, 2019 at 2:04 pm	and is filed under News. You can follow any responses to this entry through the RSS 2.0 feed. Both comments and pings are currently closed.